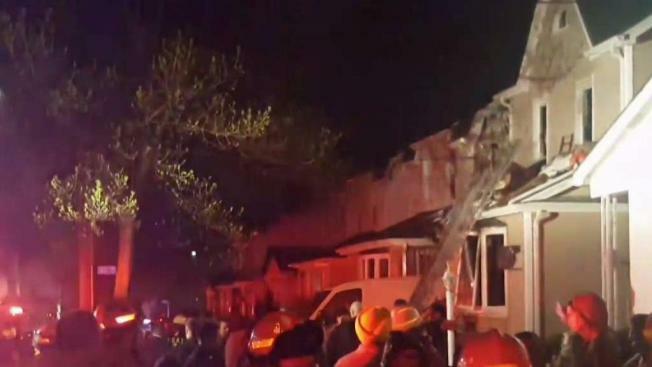 A massive house fire in Queens killed three family members gathered to plan a wedding and sent eight more to the hospital with serious injuries early Sunday, officials said. Officers responded to a call minutes before midnight Saturday at a home on 211th Street in the Queens Village neighborhood, firefighters and the NYPD said. It took 138 firefighters nearly 90 minutes to get the three-alarm blaze under control. A total of 11 people were taken from the home to local hospitals. Police say two women and a man died in the fire. They say the women were 82-year-old Ragvir Kaur-Kainth and 32-year-old Harleen Kaur and the man was 87-year-old Pyara Kainth. Eight other people were hospitalized, including one in critical condition. Those hurt included an 8-year-old girl and a 6-year-old boy. Fire marshals are still investigating a potential cause, but firefighters said nothing immediately indicated it was suspicious. Meanwhile, just hours later, a serious apartment fire in Harlem hurt 12 people, including an adult and two children who suffered life-threatening injuries. The blaze on the 29th floor of a building at the northeast corner of Central Park broke out just before 7 a.m.